Metal casement window from "Hope's Metal Windows and Casements, 1818-1926." Photo: Courtesy, Hope's Windows, Inc. The Secretary of the Interior's "Standards for Rehabilitation" require that where historic windows are individually significant features, or where they contribute to the character of significant facades, their distinguishing visual qualities must not be destroyed. Further, the rehabilitation guidelines recommend against changing the historic appearance of windows through the use of inappropriate designs, materials, finishes, or colors which radically change the sash, depth of reveal, and muntin configuration; the reflectivity and color of the glazing; or the appearance of the frame. Windows are among the most vulnerable features of historic buildings undergoing rehabilitation. This is especially the case with rolled steel windows, which are often mistakenly not deemed worthy of preservation in the conversion of old buildings to new uses. The ease with which they can be replaced and the mistaken assumption that they cannot be made energy efficient except at great expense are factors that typically lead to the decision to remove them. Maintaining historic steel windows for continued use is always recommended. Photo: NPS files. In many cases, however, repair and retrofit of the historic windows are more economical than wholesale replacement, and all too often, replacement units are unlike the originals in design and appearance. If the windows are important in establishing the historic character of the building, insensitively designed replacement windows may diminish—or destroy—the building's historic character. This Brief identifies various types of historic steel windows that dominated the metal window market from 1890-1950. It then gives criteria for evaluating deterioration and for determining appropriate treatment, ranging from routine maintenance and weatherization to extensive repairs, so that replacement may be avoided where possible.1 This information applies to do-it-yourself jobs and to large rehabilitations where the volume of work warrants the removal of all window units for complete overhaul by professional contractors. This Brief is not intended to promote the repair of ferrous metal windows in every case, but rather to insure that preservation is always the first consideration in a rehabilitation project. Some windows are not important elements in defining a building's historic character; others are highly significant, but so deteriorated that repair is infeasible. In such cases, the Brief offers guidance in evaluating appropriate replacement windows. Although metal windows were available as early as 1860 from catalogues published by architectural supply firms, they did not become popular until after 1890. Two factors combined to account for the shift from wooden to metal windows about that time. Technology borrowed from the rolling industry permitted the mass production of rolled steel windows. This technology made metal windows cost competitive with conventional wooden windows. In addition, a series of devastating urban fires in Boston, Baltimore, Philadelphia, and San Francisco led to the enactment of strict fire codes for industrial and multi-story commercial and office buildings. As in the process of making rails for railroads, rolled steel windows were made by passing hot bars of steel through progressively smaller, shaped rollers until the appropriate angled configuration was achieved. The rolled steel sections, generally 1/8" thick and 1" - 1-1/2" wide, were used for all the components of the windows: sash, frame, and subframe. With the addition of wire glass, a fire-resistant window resulted. These rolled steel windows are almost exclusively found in masonry or concrete buildings. A by-product of the fire-resistant window was the strong metal frame that permitted the installation of larger windows and windows in series. The ability to have expansive amounts of glass and increased ventilation dramatically changed the designs of late 19th and early 20th century industrial and commercial buildings. The newly available, reasonably priced steel windows soon became popular for more than just their fire-resistant qualities. They were standardized, extremely durable, and easily transported. These qualities led to the use of steel windows in every type of construction, from simple industrial and institutional buildings to luxury commercial and apartment buildings. Casement, double-hung, pivot, projecting, austral, and continuous windows differed in operating and ventilating capacities. 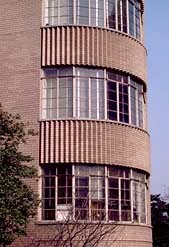 In addition, the thin profiles of metal windows contributed to the streamlined appearance of the Art Deco, Art Moderne, and International Styles, among others. Historic metal windows provide abundant natural light in this rehabilitated industrial space. Photo: NPS files. The extensive use of rolled steel metal windows continued until after World War II when cheaper, noncorroding aluminum windows became increasingly popular. While aluminum windows dominate the market today, steel windows are still fabricated. Should replacement of original windows become necessary, replacement windows may be available from the manufacturers of some of the earliest steel windows. Before an informed decision can be made whether to repair or replace metal windows, however, the significance of the windows must be determined and their physical condition assessed. An assessment of the significance of the windows should begin with a consideration of their function in relation to the building's historic use and its historic character. Windows that help define the building's historic character should be preserved even if the building is being converted to a new use. For example, projecting steel windows used to introduce light and an effect of spaciousness to a warehouse or industrial plant can be retained in the conversion of such a building to offices or residences. Other elements in assessing the relative importance of the historic windows include the design of the windows and their relationship to the scale, proportion, detailing and architectural style of the building. While it may be easy to determine the aesthetic value of highly ornamented windows, or to recognize the importance of streamlined windows as an element of a style, less elaborate windows can also provide strong visual interest by their small panes or projecting planes when open, particularly in simple, unadorned industrial buildings. One test of the importance of windows to a building is to ask if the overall appearance of the building would be changed noticeably if the windows were to be removed or radically altered. If so, the windows are important in defining the building's historic character, and should be repaired if their physical condition permits. Steel window repair should begin with a careful evaluation of the physical condition of each unit. Either drawings or photographs, liberally annotated, may be used to record the location of each window, the type of operability, the condition of all three parts—sash, frame and subframe—and the repairs essential to its continued use. 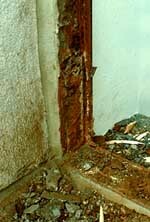 Specifically, the evaluation should include: presence and degree of corrosion; condition of paint; deterioration of the metal sections, including bowing, misalignment of the sash, or bent sections; condition of the glass and glazing compound; presence and condition of all hardware, screws, bolts, and hinges; and condition of the masonry or concrete surrounds, including need for caulking or resetting of improperly sloped sills. Corrosion, principally rusting in the case of steel windows, is the controlling factor in window repair; therefore, the evaluator should first test for its presence. Corrosion can be light, medium, or heavy, depending on how much the rust has penetrated the metal sections. If the rusting is merely a surface accumulation or flaking, then the corrosion is light. If the rusting has penetrated the metal (indicated by a bubbling texture), but has not caused any structural damage, then the corrosion is medium. If the rust has penetrated deep into the metal, the corrosion is heavy. Heavy corrosion generally results in some form of structural damage, through delamination, to the metal section, which must then be patched or spliced. A sharp probe or tool, such as an ice pick, can be used to determine the extent of corrosion in the metal. If the probe can penetrate the surface of the metal and brittle strands can be dug out, then a high degree of corrosive deterioration is present. In addition to corrosion, the condition of the paint, the presence of bowing or misalignment of metal sections, the amount of glass needing replacement, and the condition of the masonry or concrete surrounds must be assessed in the evaluation process. These are key factors in determining whether or not the windows can be repaired in place. The more complete the inventory of existing conditions, the easier it will be to determine whether repair is feasible or whether replacement is warranted. Following inspection and analysis, a plan for the rehabilitation can be formulated. The actions necessary to return windows to an efficient and effective working condition will fall into one or more of the following categories: routine maintenance, repair, and weatherization. The routine maintenance and weatherization measures described here are generally within the range of do-it-yourselfers. Other repairs, both moderate and major, require a professional contractor. Major repairs normally require the removal of the window units to a workshop, but even in the case of moderate repairs, the number of windows involved might warrant the removal of all the deteriorated units to a workshop in order to realize a more economical repair price. Replacement of windows should be considered only as a last resort. Since moisture is the primary cause of corrosion in steel windows, it is essential that excess moisture be eliminated and that the building be made as weathertight as possible before any other work is undertaken. Moisture can accumulate from cracks in the masonry, from spalling mortar, from leaking gutters, from air conditioning condensation runoff, and from poorly ventilated interior spaces. Finally, before beginning any work, it is important to be aware of health and safety risks involved. Steel windows have historically been coated with lead paint. The removal of such paint by abrasive methods will produce toxic dust. Therefore, safety goggles, a toxic dust respirator, and protective clothing should be worn. Similar protective measures should be taken when acid compounds are used. Local codes may govern the methods of removing lead paints and proper disposal of toxic residue. DOUBLE-HUNG industrial windows duplicated the look of traditional wooden windows. Metal double-hung windows were early examples of a building product adapted to meet stringent new fire code requirements for manufacturing and high-rise buildings in urban areas. Soon supplanted in industrial buildings by less expensive pivot windows, double-hung metal windows regained popularity in the 1940s for use in speculative suburban housing. PIVOT windows were an early type of industrial window that combined inexpensive first cost and low maintenance. Pivot windows became standard for warehouses and power plants where the lack of screens was not a problem. The window shown here is a horizontal pivot. Windows that turned about a vertical axis were also manufactured (often of iron). Such vertical pivots are rare today. PROJECTING windows, sometimes called awning or hopper windows, were perfected in the 1920s for industrial and institutional buildings. They were often used in "combination" windows, in which upper panels opened out and lower panels opened in. Since each movable panel projected to one side of the frame only, unlike pivot windows, for example, screens could be introduced. 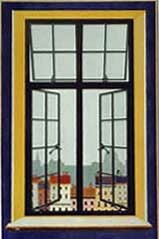 AUSTRAL windows were also a product of the 1920s. They combined the appearance of the double-hung window with the increased ventilation and ease of operation of the projected window. (When fully opened, they provided 70% ventilation as compared to 50% ventilation for double-hung windows.) Austral windows were often used in schools, libraries and other public buildings. CASEMENT windows adapted the English tradition of using wrought iron casements with leaded cames for residential use. Rolled steel casements (either single, as shown, or paired) were popular in the 1920s for cottage style residences and Gothic style campus architecture. More streamlined casements were popular in the 1930s for institutional and small industrial buildings. CONTINUOUS windows were almost exclusively used for industrial buildings requiring high overhead lighting. Long runs of clerestory windows operated by mechanical tension rod gears were typical. Long banks of continuous windows were possible because the frames for such windows were often structural elements of the building. A preliminary step in the routine maintenance of steel windows is to remove surface dirt and grease in order to ascertain the degree of deterioration, if any. Such minor cleaning can be accomplished using a brush or vacuum followed by wiping with a cloth dampened with mineral spirits or denatured alcohol. caulking the masonry surrounds with a high quality elastomeric caulk. Recommended methods for removing light rust include manual and mechanical abrasion or the application of chemicals. Burning off rust with an oxyacetylene or propane torch, or an inert gas welding gun, should never be attempted because the heat can distort the metal. In addition, such intense heat (often as high as 3800 deg. F) vaporizes the lead in old paint, resulting in highly toxic fumes. Furthermore, such heat will likely result in broken glass. Rust can best be removed using a wire brush, an aluminum oxide sandpaper, or a variety of power tools adapted for abrasive cleaning such as an electric drill with a wire brush or a rotary whip attachment. Adjacent sills and window jambs may need protective shielding. Rust can also be removed from ferrous metals by using a number of commercially prepared anticorrosive acid compounds. Effective on light and medium corrosion, these compounds can be purchased either as liquids or gels. Several bases are available, including phosphoric acid, ammonium citrate, oxalic acid and hydrochloric acid. Hydrochloric acid is generally not recommended; it can leave chloride deposits, which cause future corrosion. Phosphoric acid-based compounds do not leave such deposits, and are therefore safer for steel windows. However, any chemical residue should be wiped off with damp cloths, then dried immediately. Industrial blow-dryers work well for thorough drying. The use of running water to remove chemical residue is never recommended because the water may spread the chemicals to adjacent surfaces, and drying of these surfaces may be more difficult. Acid cleaning compounds will stain masonry; therefore plastic sheets should be taped to the edge of the metal sections to protect the masonry surrounds. The same measure should be followed to protect the glazing from etching because of acid contact. The historic steel sash is shown in place, prior to its removal and replacement with inappropriate aluminum sash (see below). Photo: NPS files. Measures that remove rust will ordinarily remove flaking paint as well. Remaining loose or flaking paint can be removed with a chemical paint remover or with a pneumatic needle scaler or gun, which comes with a series of chisel blades and has proven effective in removing flaking paint from metal windows. Well-bonded paint may serve to protect the metal further from corrosion, and need not be removed unless paint buildup prevents the window from closing tightly. The edges should be feathered by sanding to give a good surface for repainting. Next, any bare metal should be wiped with a cleaning solvent such as denatured alcohol, and dried immediately in preparation for the application of an anticorrosive primer. Since corrosion can recur very soon after metal has been exposed to the air, the metal should be primed immediately after cleaning. Spot priming may be required periodically as other repairs are undertaken. Anticorrosive primers generally consist of oil-alkyd based paints rich in zinc or zinc chromate.2 Red lead is no longer available because of its toxicity. All metal primers, however, are toxic to some degree and should be handled carefully. Two coats of primer are recommended. Manufacturer's recommendations should be followed concerning application of primers. The maintenance procedures described above will be insufficient when corrosion is extensive, or when metal window sections are misaligned. Medium to heavy corrosion that has not done any structural damage to the metal sections can be removed either by using the chemical cleaning process described under "Routine Maintenance" or by sandblasting. Since sandblasting can damage the masonry surrounds and crack or cloud the glass, metal or plywood shields should be used to protect these materials. The sandblasting pressure should be low, 80-100 pounds per square inch, and the grit size should be in the range of #10–#45. Glass peening beads (glass pellets) have also been successfully used in cleaning steel sections. While sandblasting equipment comes with various nozzle sizes, pencil-point blasters are most useful because they give the operator more effective control over the direction of the spray. The small aperture of the pencil-point blaster is also useful in removing dried putty from the metal sections that hold the glass. As with any cleaning technique, once the bare metal is exposed to air, it should be primed as soon as possible. This includes the inside rabbeted section of sash where glazing putty has been removed. To reduce the dust, some local codes allow only wet blasting. In this case, the metal must be dried immediately, generally with a blowdrier (a step that the owner should consider when calculating the time and expense involved). Either form of sandblasting metal covered with lead paints produces toxic dust. Proper precautionary measures should be taken against toxic dust and silica particles. 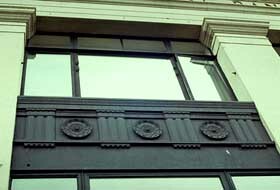 The historic steel sash (see photo above) was removed and replaced with modern aluminum sash, resulting in a negative visual impact on the building's historic character. Photo: NPS files. 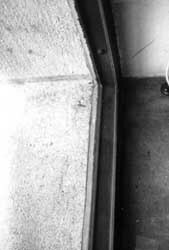 Bent or bowed metal sections may be the result of damage to the window through an impact or corrosive expansion. If the distortion is not too great, it is possible to re-align the metal sections without removing the window to a metal fabricator's shop. 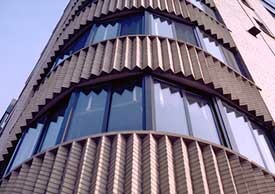 The glazing is generally removed and pressure is applied to the bent or bowed section. In the case of a muntin, a protective 2 x 4 wooden bracing can be placed behind the bent portion and a wire cable with a winch can apply progressively more pressure over several days until the section is realigned. The 2 x 4 bracing is necessary to distribute the pressure evenly over the damaged section. Sometimes a section, such as the bottom of the frame, will bow out as a result of pressure exerted by corrosion and it is often necessary to cut the metal section to relieve this pressure prior to pressing the section back into shape and making a welded repair. Once the metal sections have been cleaned of all corrosion and straightened, small holes and uneven areas resulting from rusting should be filled with a patching material and sanded smooth to eliminate pockets where water can accumulate. A patching material of steel fibers and an epoxy binder may be the easiest to apply. This steel-based epoxy is available for industrial steel repair; it can also be found in auto body patching compounds or in plumber's epoxy. As with any product, it is important to follow the manufacturer's instructions for proper use and best results. 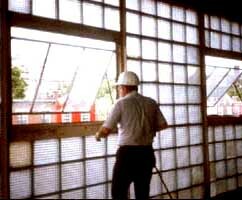 The traditional patching technique—melting steel welding rods to fill holes in the metal sections—may be difficult to apply in some situations; moreover, the window glass must be removed during the repair process, or it will crack from the expansion of the heated metal sections. After these repairs, glass replacement, hinge lubrication, painting, and other cosmetic repairs can be undertaken as necessary. To complete the checklist for routine maintenance, cracked glass, deteriorated glazing compound, missing screws, and broken fasteners will have to be replaced; hinges cleaned and lubricated; the metal windows painted, and the masonry surrounds caulked. If the glazing must be replaced, all clips, glazing beads, and other fasteners that hold the glass to the sash should be retained, if possible, although replacements for these parts are still being fabricated. When bedding glass, use only glazing compound formulated for metal windows. To clean the hinges (generally brass or bronze), a cleaning solvent and fine bronze wool should be used. The hinges should then be lubricated with a non-greasy lubricant specially formulated for metals and with an anticorrosive agent. These lubricants are available in a spray form and should be used periodically on frequently opened windows. Final painting of the windows with a paint compatible with the anticorrosive primer should proceed on a dry day. (Paint and primer from the same manufacturer should be used.) Two coats of finish paint are recommended if the sections have been cleaned to bare metal. The paint should overlap the glass slightly to insure weathertightness at that connection. Once the paint dries thoroughly, a flexible exterior caulk can be applied to eliminate air and moisture infiltration where the window and the surrounding masonry meet. Caulking is generally undertaken after the windows have received at least one coat of finish paint. The perimeter of the masonry surround should be caulked with a flexible elastomeric compound that will adhere well to both metal and masonry. The caulking used should be a type intended for exterior application, have a high tolerance for material movement, be resistant to ultraviolet light, and have a minimum durability of 10 years. Three effective compounds (taking price and other factors into consideration) are polyurethane, vinyl acrylic, and butyl rubber. In selecting a caulking material for a window retrofit, it is important to remember that the caulking compound may be covering other materials in a substrate. In this case, some compounds, such as silicone, may not adhere well. Almost all modern caulking compounds can be painted after curing completely. Many come in a range of colors, which eliminates the need to paint. If colored caulking is used, the windows should have been given two coats of finish paint prior to caulking. Damage to windows may be so severe that the window sash and sometimes the frame must be removed for cleaning and extensive rust removal, straightening of bent sections, welding or splicing in of new sections, and reglazing. These major and expensive repairs are reserved for highly significant windows that cannot be replaced; the procedures involved should be carried out only by skilled workmen. As part of the orderly removal of windows, each window should be numbered and the parts labeled. The operable metal sash should be dismantled by removing the hinges; the fixed sash and, if necessary, the frame can then be unbolted or unscrewed. (The subframe is usually left in place. Built into the masonry surrounds, it can only be cut out with a torch.) Hardware and hinges should be labeled and stored together. The two major choices for removing flaking paint and corrosion from severely deteriorated windows are dipping in a chemical bath or sandblasting. Both treatments require removal of the glass. If the windows are to be dipped, a phosphoric acid solution is preferred, as mentioned earlier. While the dip tank method is good for fairly evenly distributed rust, deep set rust may remain after dipping. For that reason, sandblasting is more effective for heavy and uneven corrosion. Both methods leave the metal sections clean of residual paint. As already noted, after cleaning has exposed the metal to the air, it should be primed immediately after drying with an anticorrosive primer to prevent rust from recurring. Sections that are seriously bent or bowed must be straightened with heat and applied pressure in a workshop. Structurally weakened sections must be cut out, generally with an oxyacetylene torch, and replaced with sections welded in place and the welds ground smooth. Finding replacement metal sections, however, may be difficult. While most rolling mills are producing modern sections suitable for total replacement, it may be difficult to find an exact profile match for a splicing repair. The best source of rolled metal sections is from salvaged windows, preferably from the same building. If no salvaged windows are available, two options remain. Either an ornamental metal fabricator can weld flat plates into a built-up section, or a steel plant can mill bar steel into the desired profile. While the sash and frame are removed for repair, the subframe and masonry surrounds should be inspected. This is also the time to reset sills or to remove corrosion from the subframe, taking care to protect the masonry surrounds from damage. Missing or broken hardware and hinges should be replaced on all windows that will be operable. Salvaged windows, again, are the best source of replacement parts. If matching parts cannot be found, it may be possible to adapt ready-made items. Such a substitution may require filling existing holes with steel epoxy or with plug welds and tapping in new screw holes. However, if the hardware is a highly significant element of the historic window, it may be worth having reproductions made. The first step in any weatherization program, caulking, has been discussed above under "Routine Maintenance." The second step is the installation of weatherstripping where the operable portion of the sash, often called the ventilator, and the fixed frame come together to reduce perimeter air infiltration. Four types of weatherstripping appropriate for metal windows are spring-metal, vinyl strips, compressible foam tapes, and sealant beads. The spring-metal, with an integral friction fit mounting clip, is recommended for steel windows in good condition. The clip eliminates the need for an applied glue; the thinness of the material insures a tight closure. The weatherstripping is clipped to the inside channel of the rolled metal section of the fixed frame. To insure against galvanic corrosion between the weatherstripping (often bronze or brass), and the steel window, the window must be painted prior to the installation of the weatherstripping. This weatherstripping is usually applied to the entire perimeter of the window opening, but in some cases, such as casement windows, it may be best to avoid weatherstripping the hinge side. The natural wedging action of the weatherstripping on the three sides of the window often creates an adequate seal. Vinyl weatherstripping can also be applied to metal windows. Folded into a "V" configuration, the material forms a barrier against the wind. Vinyl weatherstripping is usually glued to the frame, although some brands have an adhesive backing. As the vinyl material and the applied glue are relatively thick, this form of weatherstripping may not be appropriate for all situations. Compressible foam tape weatherstripping is often best for large windows where there is a slight bending or distortion of the sash. In some very tall windows having closure hardware at the sash midpoint, the thin sections of the metal window will bow away from the frame near the top. If the gap is not more than 1/4", foam weatherstripping can normally fill the space. If the gap exceeds this, the window may need to be realigned to close more tightly. The foam weatherstripping comes either with an adhesive or plain back; the latter variety requires application with glue. Compressible foam requires more frequent replacement than either spring-metal or vinyl weatherstripping. A fourth type of successful weatherstripping involves the use of a caulking or sealant bead and a polyethylene bond breaker tape. After the window frame has been thoroughly cleaned with solvent, permitted to dry, and primed, a neat bead of low modulus (firm setting) caulk, such as silicone, is applied. A bond breaker tape is then applied to the operable sash covering the metal section where contact will occur. The window is then closed until the sealant has set (27 days, depending on temperature and humidity). When the window is opened, the bead will have taken the shape of the air infiltration gap and the bond breaker tape can be removed. This weatherstripping method appears to be successful for all types of metal windows with varying degrees of air infiltration. Since the several types of weatherstripping are appropriate for different circumstances, it may be necessary to use more than one type on any given building. Successful weatherstripping depends upon using the thinnest material adequate to fill the space through which air enters. Weatherstripping that is too thick can spring the hinges, thereby resulting in more gaps. SPRING-METAL comes in bronze, brass or stainless steel with an integral friction fit clip. The weatherstripping is applied after the repaired windows are painted to avoid galvanic corrosion. This type of thin weatherstripping is intended for windows in good condition. VINYL STRIPS are scored and fold into a "V" configuration. Applied adhesive is necessary which will increase the thickness of the weatherstripping, making it inappropriate for some situations. The weatherstripping is generally applied to the window after painting. Closed cell FOAM TAPE comes either with or without an adhesive backing. It is effective for windows with a gap of approximately 1/4" and is easy to install. However, this type of weatherstripping will need frequent replacement on windows in regular use. The metal section should be cleaned of all dirt and grease prior to its application. SEALANT BEAD. This very effective type of weatherstripping involves the application of a clean bead of firm setting caulk on the primed frame with a polyethelene bond breaker tape on the operable sash. The window is then closed until the bead has set and takes the form of the gap. The sash is then opened and the tape is removed leaving the set caulk as the weatherstripping. Historic steel sash can be fitted with dual glazing to improve thermal efficiency. Photo: NPS files. Another weatherization treatment is to install an additional layer of glazing to improve the thermal efficiency of the existing window. The decision to pursue this treatment should proceed from careful analysis. Each of the most common techniques for adding a layer of glazing will effect approximately the same energy savings (approximately double the original insulating value of the windows); therefore, cost and aesthetic considerations usually determine the choice of method. Methods of adding a layer of glazing to improve thermal efficiency include adding a new layer of transparent material to the window; adding a separate storm window; and replacing the single layer of glass in the window with thermal glass. The least expensive of these options is to install a clear material (usually rigid sheets of acrylic or glass) over the original window. The choice between acrylic and glass is generally based on cost, ability of the window to support the material, and long-term maintenance outlook. If the material is placed over the entire window and secured to the frame, the sash will be inoperable. If the continued use of the window is important (for ventilation or for fire exits), separate panels should be affixed to the sash without obstructing operability. Glass or acrylic panels set in frames can be attached using magnetized gaskets, interlocking material strips, screws or adhesives. Acrylic panels can be screwed directly to the metal windows, but the holes in the acrylic panels should allow for the expansion and contraction of this material. A compressible gasket between the prime sash and the storm panel can be very effective in establishing a thermal cavity between glazing layers. To avoid condensation, 1/8" cuts in a top corner and diagonally opposite bottom corner of the gasket will provide a vapor bleed, through which moisture can evaporate. (Such cuts, however, reduce thermal performance slightly.) If condensation does occur, however, the panels should be easily removable in order to wipe away moisture before it causes corrosion. The second method of adding a layer of glazing is to have independent storm windows fabricated. (Pivot and austral windows, however, which project on either side of the window frame when open, cannot easily be fitted with storm windows and remain operational.) The storm window should be compatible with the original sash configuration. For example, in paired casement windows, either specially fabricated storm casement windows or sliding units in which the vertical meeting rail of the slider reflects the configuration of the original window should be installed. The decision to place storm windows on the inside or outside of the window depends on whether the historic window opens in or out, and on the visual impact the addition of storm windows will have on the building. Exterior storm windows, however, can serve another purpose besides saving energy: they add a layer of protection against air pollutants and vandals, although they will partially obscure the prime window. For highly ornamental windows this protection can determine the choice of exterior rather then interior storm windows. The third method of installing an added layer of glazing is to replace the original single glazing with thermal glass. Except in rare instances in which the original glass is of special interest (as with stained or figured glass), the glass can be replaced if the hinges can tolerate the weight of the additional glass. The rolled metal sections for steel windows are generally from 1" 1-1/2" thick. Sash of this thickness can normally tolerate thermal glass, which ranges from 3/8" 5/8". (Metal glazing beads, readily available, are used to reinforce the muntins, which hold the glass.) This treatment leaves the window fully operational while preserving the historic appearance. It is, however, the most expensive of the treatments discussed here. Repair of historic windows is always preferred within a rehabilitation project. Replacement should be considered only as a last resort. However, when the extent of deterioration or the unavailability of replacement sections renders repair impossible, replacement of the entire window may be justified. This is a successsful replacement in kind of the deteriorated frame shown above. Photo: Henry Chambers, AIA. In the case of significant windows, replacement in kind is essential in order to maintain the historic character of the building. However, for less significant windows, replacement with compatible new windows may be acceptable. In selecting compatible replacement windows, the material, configuration, color, operability, number and size of panes, profile and proportion of metal sections, and reflective quality of the original glass should be duplicated as closely as possible. A number of metal window manufacturing companies produce rolled steel windows. While stock modern window designs do not share the multi-pane configuration of historic windows, most of these manufacturers can reproduce the historic configuration if requested, and the cost is not excessive for large orders. Some manufacturers still carry the standard pre-World War II multi-light windows using the traditional 12" x 18" or 14" x 20" glass sizes in industrial, commercial, security, and residential configurations. In addition, many of the modern steel windows have integral weatherstripping, thermal break construction, durable vinyl coatings, insulating glass, and other desirable features. Windows manufactured from other materials generally cannot match the thin profiles of the rolled steel sections. Aluminum, for example, is three times weaker than steel and must be extruded into a boxlike configuration that does not reflect the thin historic profiles of most steel windows. Wooden and vinyl replacement windows generally are not fabricated in the industrial style, nor can they reproduce the thin profiles of the rolled steel sections, and consequently are generally not acceptable replacements. For product information on replacement windows, the owner, architect, or contractor should consult manufacturers' catalogues, building trade journals, or the Steel Window Institute, 1230 Keith Building, Cleveland, Ohio 44115. The National Park Service recommends the retention of significant historic metal windows whenever possible. Such windows, which can be a character-defining feature of a historic building, are too often replaced with inappropriate units that impair rather than complement the overall historic appearance. The repair and thermal upgrading of historic steel windows is more practicable than most people realize. Repaired and properly maintained metal windows have greatly extended service lives. They can be made energy efficient while maintaining their contribution to the historic character of the building. The technical information given in this brief is intended for most ferrous (or magnetic) metals, particularly rolled steel. While stainless steel is a ferrous metal, the cleaning and repair techniques outlined here must not be used on it as the finish will be damaged. For information on cleaning stainless steel and nonferrous metals, such as bronze, Monel, or aluminum, refer to Metals in America's Historic Buildings (see bibliography). Refer to Table IV. Types of Paint Used for Painting Metal in Metals in America's Historic Buildings, p. 139. (See bibliography). One measure of energy efficiency is the U-value (the number of BTUs per hour transferred through a square foot of material). The lower the U-value, the better the performance. According to ASHRAE HANDBOOK 1977 Fundamentals, the U-value of historic rolled steel sash with single glazing is 1.3. Adding storm windows to the existing units or reglazing with 5/8" insulating glass produces a U-value of .69. These methods of weatherizing historic steel windows compare favorably with rolled steel replacement alternatives: with factory installed 1" insulating glass (.67 U-value); with added thermal break construction and factory finish coatings (.62 U-value). The author gratefully acknowledges the invaluable assistance of co-worker Michael Auer in preparing this brief for publication. This publication is an extension of research initiated by Frederec E. Kleyle. Special thanks are given to Hope's Architectural Products, Inc., Jamestown, NY, for their generous contribution of historic metal window catalogues which were an invaluable source of information. The following individuals are also to be thanked for reviewing the manuscript and making suggestions: Hugh Miller, Chief, Park Historic Architecture Division, National Park Service; Barclay L. Rogers, Museum Services, National Park Service; Susan M. Young, Steel Window Institute, and Danny Schlichenmaier, State Building Division, Lincoln, Nebraska. Finally, thanks go to Technical Preservation Services Branch staff and to cultural resources staff of the National Park Service Regional Offices, whose valuable comments were incorporated into the final text and who contributed to the publication of this brief. ASHRAE Handbook 1977 Fundamentals. New York: American Society of Heating, Refrigerating and Air-conditioning Engineers, 1978. Crittal, W. F. A Metal Window Dictionary. London: Curwen Press, 1926. Reprinted by B.T. Batsford. Ltd., 1953. Gayle, Margot; David W. Look, AIA; John G. Waite. Metals in America's Historic Buildings: Uses and Preservation Treatments. Technical Preservation Services, U.S. Department of the Interior. Washington,D.C. 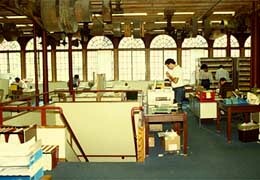 : U.S. Government Printing Office, 1980. Gillet, William. "Steel Windows." Windows and Glass in the Exterior of Buildings. National Academy of Sciences Publication 478. Washington, D.C.: 1957,7578. Sarton, R. H. "Selecting and Specifying an Appropriate Type of Steel Window." Metalcraft. Vol. 6, No. 1 (January, 1931): 4348, 6465. Sweet's Architectural Catalogue. 13th Edition, New York, Sweets Catalogue Service, Inc., 1918.